Discover the truth behind the myth in The Complete Jack the Ripper by Paul Begg and John Bennett. In this comprehensive account of London's most infamous killer, the foremost authorities on the case explore the facts behind the most grisly episode of the Victorian era. Setting the scene in the impoverished East End, the authors' meticulous research offers detailed accounts of the lives of the victims and an examination of the police investigation. 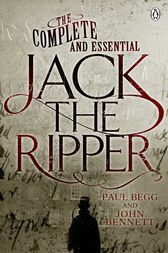 The Complete Jack the Ripper is the definitive book by Paul Begg and John Bennett, exploring both the myth and reality behind the allusive killer. Paul Begg and John Bennett are researchers and authors, widely recognized as authorities on Jack the Ripper. Paul Begg's books include Jack the Ripper: The Facts, Jack the Ripper: The Definitive History, and he is a co-author of The Jack the Ripper A to Z.
John Bennett has written numerous articles and lectured frequently on Jack the Ripper and the East End of London. He has acted as adviser to and participated in documentaries made by television channels worldwide and was the co-writer for the successful Channel 5 programme Jack the Ripper: The Definitive Story. He is author of E1: A Journey Through Whitechapel and Spitalfields and co-author of Jack the Ripper: CSI Whitechapel.